Three Peaks Web Design have helped many Cumbrian businesses in the past few years, below are just a few. If you want to be a part of our journey, contact us. SPACE needed a multi-page portfolio site that reflected the quality of their architectural design work. We developed a clean user-friendly site, advised on content and suggested a photographer to showcase their buildings at their best. We provide secure website and email hosting for this fully responsive and editable site. This southern estate agents required a complete overhaul of their existing site to modernise and streamline. Stratfords wanted their site integrated with Rightmove and Feefo and we designed and developed the site to be bright and inviting. Penrith BID required a new website that was simple and clear for BID levy payers. Their previous site had spiralled out of control, so we streamlined content and made the site more accessible and inviting. We also provide website and email hosting. Jeannie's Kitchen Garden was a new enterprise that needed an online retail solution for their range of artisan preserves. We designed the site in line with the new branding ad packaging created and advised on content and photography. Lilylou’s needed an ecommerce site that allowed it to sell flowers online as well as to appeal and attract couples for their Lake District wedding floristry. We designed the site and advised on content before developing and modernising the overall branding retaining their existing logo. The site was already taking orders on it’s soft launch and has continued to be successful. After creating the core identity for covaxe, we built a website for potential investors in the new combustion engine. Fully responsive, editable and informative, there was a lot of information to pack into the site, whilst retaining a clean aesthetic. 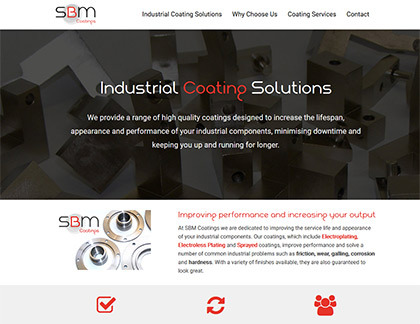 SBM Coatings required a single page website to display what they do in an effective and user friendly way. We created a new brand identity and followed their new brand throughout the web design. Website and branding for a local flower farm. This website needed to appeal to both direct customers and wholesale florists and integrate with mail chimp lists to be able to contact prospective clients seasonally. All imagery has been designed to be able to be adapted with the seasons. A redesign for the creperie and a new website to showcase the new clean and simple aesthetic. Both websites were developed together to ensure cohesiveness and have more functionality behind the scenes which can be turned on as and when required. Throughstone Consulting needed a clear and simple responsive website to launch their new business. We developed the site in conjunction with branding and iconography. 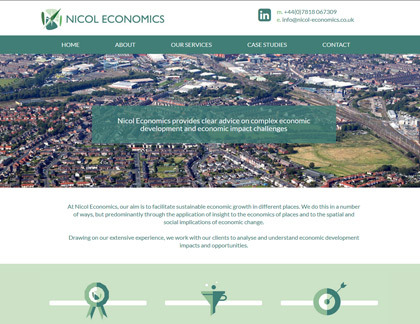 Nicol Economics required a creative responsive multi-page website with the ability to edit all content and blog. We also provide website and email hosting. 07863 546 596 or send us a message below! Three Peaks Web Design in Cumbria are a creative web design agency specialising in affordable web design. We have over 15 years of experience designing for large and small businesses in Cumbria and beyond.